Sometimes a picture is worth more than a thousand words. At Brentano's, it's worth 15 percent off your next purchase. 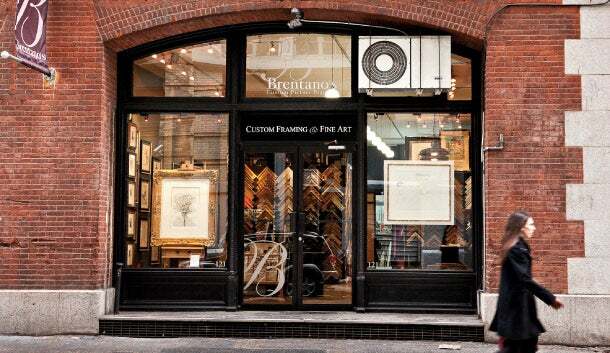 A custom framing shop and art gallery in Manhattan's trendy SoHo neighborhood, Brentano's has traditionally relied on word-of-mouth to drive revenue; in fact, owner Joseph Brentano calculates that 85 percent of his sales are from referrals or repeat customers. But hearing about the shop is one thing; seeing its handcrafted, museum-quality frames up close is another. "We're a destination business," Brentano explains. "When you frame someone's treasure and you present it artistically and elegantly, that's a very strong advertising tool." Now Brentano's is taking steps to guarantee that even more people get an eyeful of the masterpieces adorning its walls. Late last year the shop partnered with Kapture, a mobile marketing platform that rewards users for sharing photos from local businesses on social media. Any iPhone owner who snaps a picture inside Brentano's and uses Kapture to post the image to a Facebook or Twitter account receives a 15 percent discount on their next framing order. "Kapture is about instant gratification and instant sharing with people who may not have known about me otherwise. Everything about my business is visual," Brentano says. "When you see something we've framed, you understand the 'wow' factor. Kapture is a perfect fit." Kapture is at the forefront of a growing segment of startups combining the social graph with local advertising and mobile services. This integration of social, local and mobile platforms--dubbed SoLoMo by Silicon Valley wags--promises to revolutionize how small businesses interact with customers, exploiting the ubiquity of smartphones and social media and enabling merchants to deliver permission-based deals to connected consumers within their immediate vicinity. "SoLoMo gives local businesses tools and products that allow them to connect with customers in ways they couldn't do in the past," says Kapture co-founder and president Michael Szewczyk. "We're closing the loop between consumers and merchants." The SoLoMo portmanteau may be relatively new (not to mention a bit awkward), but services like Kapture that practice it are leveraging consumer and technology trends that have been percolating for years. More than 125 million U.S. consumers carry smartphones, representing 54 percent of mobile subscribers nationwide, according to comScore. Seventy-four percent of them use their devices to access local information like directions; 38 percent wish to receive promotional messages based on their whereabouts; and 18 percent have checked in at merchants using social apps like foursquare. Facebook leads all other apps in mobile engagement, in December attracting more than 85 million unique U.S. smartphone owners. Consumers aren't the only ones embracing social networking, of course. "Over 60 percent of small and medium-size businesses now participate in social media in some way," says Peter Krasilovsky, vice president at advisory firm BIA/Kelsey, which forecasts that social-mobile ad revenue will grow from $500 million in 2012 to $1.5 billion in 2016, a compound annual growth rate of 28.5 percent. "We're seeing a shift away from traditional advertising into new channels," Krasilovsky states. "Everybody got social media right away, but mobile takes a lot more instruction. It's not as intuitive. But more and more consumers are using mobile for discovery or search, which means if you're the type of business that relies on that kind of traffic, you have to make sure you leverage geolocation." That's where Kapture comes in. Its platform helps small businesses expand into hyperlocal mobile marketing without the expense of building a dedicated mobile app or mobile website; at the same time, it incentivizes behaviors that are already ingrained in consumers' DNA. Kapture's free iPhone app identifies the user's location and presents a list of nearby businesses across a variety of verticals, each with a call to action; for example, snapping and sharing a photo of a juice at health-food store Organic Avenue earns a free booster shot. Once a photo is uploaded to the web, shoppers can redeem their rewards instantly, save them for a subsequent visit or gift them to friends. "We started Kapture with the realization that people are taking photos of meals and fashions and sharing them with friends, but not receiving anything in return," says Szewczyk, who formed the Brooklyn-based firm in 2011 and has signed up some 300 New York-area merchant partners. "All we've done is taken an organic process and added a layer around location and a small thank you for sharing that content." Kapture has raised $1 million in funding and plans to launch an Android app this year. For now, businesses launch Kapture promotions free of charge; Szewczyk is still deliberating how to monetize, mulling options such as subscription billing. Partners like Brentano are already seeing revenue gains: Three months on, he counts at least five custom framing sales as a result of his Kapture promotion--an impressive number in his particular line of work. "Your customers are showing their followers what's happening at your location. They're telling stories through these photos," Szewczyk says. "People consume so much information and so much data. It's very hard to get messages through all that noise. But when information comes from friends and other trusted sources, they really listen." Kapture is not alone in the SoLoMo space. Boston-based startup SidewalkAd follows a similar model: Its free iPhone and Android apps display deals from merchants within the consumer's immediate radius, allowing users to claim virtual coupons that can be redeemed immediately or saved to their in-app virtual wallets. Users can also share offers via Facebook. SidewalkAd CEO Cliff Lee says the inspiration was the venerable sandwich board placed outside of storefronts to attract passersby. "We wanted to take that idea, virtualize it and put it on a smartphone," Lee says. "The difference is that customers are no longer limited to being in or near your store to see that you're running a promotion. Now they can find out using the GPS on their phone." SidewalkAd charges merchants $40 per month for unlimited mobile coupons. Clients can create promotions in less than two minutes using any computer and update their ad copy in real time, giving them the flexibility to promote daily specials or instantly revise offers to drive more business. Rather than accepting a paper coupon, merchants simply tap the SidewalkAd app's "redeem" button on the customer's smartphone--no muss, no fuss. "We wanted to keep it real simple," Lee says. "Whatever you might put on your in-store signage or sandwich board, you can put into a SidewalkAd coupon. We also conducted a bunch of surveys before we built this app, and overwhelmingly consumers said, 'No pop-up ads, don't buzz me and don't send me daily e-mails.' So we don't alert you when you're in proximity of a participating business--you have to opt in. We do send out reminders 30 days and 15 days before a coupon you've saved expires." SidewalkAd has signed on close to 200 merchant partners, including the London Harness Company, a Wellesley, Mass., luggage and leather-goods seller. "SidewalkAd is right at your fingers--customers don't have to bring in a piece of paper or go back home for the coupon they forgot," says Demian Wendrow, the store's director of operations. Wendrow and other Wellesley merchants have banded together to roll out concurrent SidewalkAd promotions in conjunction with community events. During the most recent Wellesley Night Lights, which caters to incoming college students each September, some three dozen businesses offered deals within the app, translating to close to 300 mobile-coupon redemptions in one evening. "Each merchant did something different, but we all worked in collaboration with each other," Wendrow says. "Customers could access SidewalkAd to learn about the event itself, see who was involved and what kind of promotion each merchant was running. Not only did the app generate awareness into the things we're doing in Wellesley, butit brought all the local businesses together as a team." Platforms like Kapture and SidewalkAd appear to fulfill many mobile-marketing demands for SMBs. A survey conducted in late 2012 by advertising research and consulting firm Borrell Associates found that 75 percent of U.S. small-business owners believe the ability to target ads by location is an important facet of a mobile campaign, and another 75 percent say the ability to optimize promotions in real time is equally critical. The problem facing SoLoMo is the one facing all SMB-friendly mobile-advertising initiatives: It's far, far ahead of the curve. BIA/Kelsey reports that U.S. SMBs spend an average of $1,190 per year on digital marketing, up from $876 in 2011, but only 14.7 percent have even rolled out mobile-optimized websites. For the remaining 85 percent, a cutting-edge concept like integrated SoLoMo can seem as futuristic as jet packs and hover cars. "Small businesses don't know the term SoLoMo," acknowledges Sabira Arefin, founder and CEO of LocalBlox, an online community networking platform that encompasses local, social and mobile marketing services alongside a business directory, discussion forums, social media integration and collaborative tools. In April 2012 LocalBlox introduced a self-serve SoLoMo platform that gives merchants the tools to provide smartphone-ready business information, as well as deals and coupons. Arefin admits that LocalBlox is still building its SoLoMo presence, but says the firm continues adding features and services, promising an even more seamless transition when--not if--small businesses fully embrace their mobile future. "Small businesses see more and more that the world is going mobile, but they still don't have a lot of knowledge about what's out there," she says. "They also know they need to be on Facebook and Twitter, they know they have to be aware of concepts like SEO and they want it all to fit within a limited budget and limited time in their day. [SoLoMo] services offer them something with all the components they want. Once they see it, they get it." For all the radical innovations reshaping the mobile marketing landscape, SMS--the no-frills, 20-year-old text-messaging service still limited to 160 characters--remains the backbone platform for businesses looking to reach consumers' wireless devices. The secrets to its staying power? Simplicity, reach and price. While 54 percent of American mobile subscribers carry smartphones with data access, the other 46 percent still rely on old-school cell phones--and text-message promotions reach both. Small businesses can roll out campaigns for as little as $10 per month and know that they'll be seen. Studies indicate that 90 percent of text messages are read within three minutes of arrival and 98 percent are read within an hour. By comparison, open rates on marketing e-mails average 20 percent. A survey by online advertising services firm RadiumOne revealed that among the 61.9 percent of adult women who've redeemed grocery and consumer goods retail coupons via mobile device, 42.4 percent cited a preference for SMS-based offers. That's nearly double the preference rate for the next-most-popular mobile technology, QR codes. Now that's keeping it simple. Quick-response (QR) codes were supposed to be dead meat by now. Critics have questioned their utility and viability since the scannable matrix barcodes first came to market in 1994, and their evolution into mobile marketing's hot new technology in 2010 has done little to silence naysayers. That said, QR codes are finding a place in the marketing universe. A study by mobile technology firm Nellymoser states that readers of national magazines scan QR codes, Microsoft Tags and other mobile-action codes at an average rate of 6.4 percent--compare that with direct-mail average response rates of 4.4 percent and average catalog-response rates of 4.3 percent. However, it's as a payment tool that the QR code is finding new life. Apple, for one, has taken the plunge: When consumers add Apple Store gift cards to their iPhone's Passbook virtual wallet, the app automatically generates a QR code optimized for in-store redemption. The same functionality is behind Square's Wallet app, which displays a QR code that merchants scan to complete a transaction. There's also the Starbucks Card mobile app, which connects smartphones to prepaid Starbucks accounts to enable QR code-based transactions. That app now accounts for 2.1 million mobile purchases each week. If QR codes are good enough for Apple, Square and Starbucks, they may be good enough for your business, too.